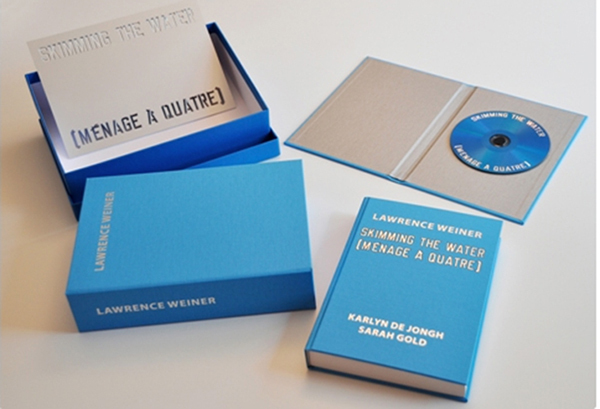 Blue box containing a book :silver-lettered blue (Gauloises blue) cloth-covered boards (hardcover), 24 x 17,5 x 5,5 cms., 224 pp. following the conversation between Karlijn de Jongh, Sarah Gold and Sophia Thomassen (i.e. an absurdedly long theatre play), + a CD housed in a silver-lettered cloth-covered cardboard case, + an aluminum stencil, loosely inserted, all kept together in a blue silver-lettered cardboard cassette.